Keep Strat in tune with standard trem! Italian Luthier/Amp Builder Galeazzo Frudua has some awesome Strat set-up videos at Youtube!!! Just watch how he whanks out a stock unit and keeps it in tune, then shows you how it's done. The above is just a quick yet amazing overview on setting up a standard trem to stay in tune. BUT at www.youtube.com/user/FruduaTv you'll find a series of FIVE clips in his Uploads section called, "SET UP YOUR STRAT FOR BEST TREMOLO USE". This guy breaks it all down from the very very basics! Anyone wondering how Jeff Beck & Scott Henderson can go so trem crazy without a locking system, or how EVH did the VH#1 album withOUT a Floyd, will get all the tips, tricks and physics background from Frudua's videos. Ed Note: Also check out Carl Verheyen's Strat Trem Set-up! Combining Carl's claw angle approach with Frudua's details should result in optimum Strat trem performance. 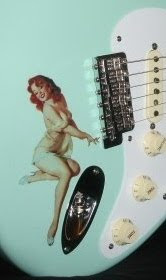 Pimp Your Strat Directory - more DIY resources & hardware suppliers.